When you have a job at a top company, usually you do not have time to look up from your computer. Yet there are some times when work maybe slow, or projects may be uninspiring, causing you to feel incredibly bored. There are not many things to do at the work place, to beat your boredom, without attracting too much attention to yourself. Making small changes in your manner of work and your way of handling projects which are given to you can go a long way in ensuring that you stop being bored at work. 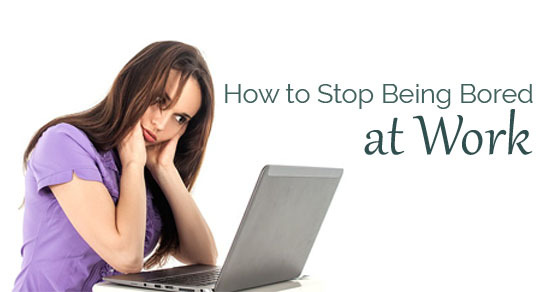 Continue reading on to know how to stop being bored at work or to get out of the feeling of “I’m bored”. The following mentioned are few tips on dealing with boredom and what to do when you are bored. Being bored at the work place is rather common indeed and one of the best things you can do is start a book club at your work place itself, encouraging your co workers to join you and actively participate. The books need not be works of fiction or fantasy; rather they should be pertaining to your work so that your boss and manager encourage you to take your plan forward. Every week all the group members should be given a book to read and when the week is up they should put forth the ideas and feedback which they want to give. This activity encourages people to think and put forth their business related ideas. In the event of being bored at the workplace, a great thing to do would be to use the time to expand your own contacts. You should make it a point to talk to the customers that walk into your workplace and develop a proper rapport with them, doing this can really help you in the time to come and your boss will also appreciate your efforts of making the customers feel at home and warmly welcomed. This having been stated ensure that you do not go over board and act too friendly with some of the clients as this is very unprofessional indeed. If you are really bored and are wondering what to do, you can make a lunch plan with a co worker and have a little fun. In addition to this if you find that being confined in the office is getting to you, you can ask your boss to assign you a field job or a job pertaining to visiting the clients as then you will not field so bored. In addition of getting to move around, you will also get a chance to know your city better. Taking on additional responsibility like this is bound to impress your boss. We live in an age where, if you have no social media presence, then no one is going to take you seriously. If you want to make it big in the business world, then you should ensure that you take time out from your busy schedule to update your social media profiles, so that you will be able to attract as much positive attention to yourself as you can. Having simply a Facebook account is not merely enough. You must ensure that you have a Twitter, Gmail, Skype as well as Linkedln accounts as well. In addition to this, if you are getting bored, use your free time to download these apps on to your smart phone. Rather than browsing aimlessly through your newsfeed it is advisable that when you are bored, you start your very own blog. You can make use of your blog to share your ideas and put forth images and summaries of projects which you have successfully managed in the past and things you are working on in the present. Maintaining a blog is a very good pastime indeed and it is a positive way to channelize your energies. If you wish, you can also use your blog as a means to earn some additional money, but don’t let doing this affect your real job. If you are bored and have nothing to do, you can use this time to organize your work area and get all your files in proper order so that it does not look like you are a clumsy worker. If your things are strewn around when a client walks in, then this is going to set a terrible reputation in their minds. When someone asks you for a paper or a form you should be able to produce it in a matter of a few minutes. Taking time out to settle your cabin or cubicle when you are bored out, that could go a long way in helping you when you are busy and have a lot of things on your mind. The best cure for boredom is to give challenging enough tasks to do. So if your feel that you are being given uninspiring tasks to look into, then you should approach your boss and tell him that you would like to work on more challenging projects in the time to come. You must ensure that you state in polite terms what you are asking, lest you come across as sounding too smug. Ensure that you are not trying to bite off more than you can chew as well. Before you approach your boss, do make it a point to thinking carefully about what it is you are asking for. When you are really bored at the office, you can stop being bored by penning down your thoughts and ideas. If you write considerably well you can consider submitting an article to the company magazine so that you can share your ideas with the others at the firm. When you do this you will come across as someone who is extremely pro active. Rather than sitting around idle you should use your time at the office doing things which are productive so that you can receive recognition and praise from your boss or seniors at the company. Most of us work in a company and do not even bother to get to know those who we work with properly. You never know, you might meet many likeminded people who will make working at the office rather fun and pleasurable for you. One of the worst things you can do at the office is remaining closed and unapproachable. Companies look to promote those employees who get along well with others. Yet this having been stated, ensure that you do not get too friendly with your co workers, such that it comes across like you are shirking your responsibilities. Be mindful of your manners at all points in time. Companies usually allot just enough work to the employees which they think the individual can handle properly. If you find that you are finishing all the tasks very fast then chances are that you are not doing the tasks to the best of your ability. You should make the most of the time which is given to you and go an extra mile in order to impress the boss. The more you do, the better it will be for you. You can be rest assured that if you give up bad or sub standard work, your boss is not going to be very happy with you. When you are so bored at work, you can watch some inspirational ted talks which are easily available online. You can watch ted talks pertaining to your career so that you are inspired and can come up with good ideas based on the things which you hear. If you come across a good ted talk which you know has something which the company can benefit from, then you should ask your boss to spare some time and have a look at it. Doing this is bound to impress your boss a great deal and show him that you genuinely love what you do. The more skills you have, the better it will be for you to bag few promotions. All employees work hard in order to be promoted. If you know that your communication skills are not too good, then you can spend your time trying to improve yourself. If possible watch some videos online and read up articles pertaining to how you can better your oratory skills. Once you become more confident then you will automatically be able to express yourself in a more powerful and forceful manner. You could also work on your typing skills if you wish. One of the best ways to beat your boredom at work is to start working on future projects so that in the time to come you will feel under pressure. If you constantly remain ahead and plan in advance then you will never feel like the work load is too much to deal with. It is only those who burn the midnight oil and do not work according to a routine that are unable to meet deadlines. Having a good work ethic is very important in order to move ahead in life. Take things seriously and work on tasks as it has been allotted to you. In order to stop feeling bored at the office you can make a list of things which you need to do as you get home. Once you make the list then you can know exactly what you have to get done. In addition to this if you have to pick up some things from the grocery store you can use your time to make out that list as well. In the event of being bored because you have done all the work which you needed to do, you can always extend a helping hand to your co workers and ask if they need any kind of assistance. You might think that doing this is of no use at all, but you can be sure that not only are your co workers appreciating your helpful attitude but your boss too is silently happy seeing your unobtrusive nature. If you are really bored at office you can use your time to browse through the internet and plan out the next vacation you can take with your family members. Doing this is very fun and engrossing but ensure that you do not get caught. Finally, rather than seeing your boredom at office as a negative thing. Think of it as something positive. Let it bring out the best in you. Use your free time to let your mind wander and come up with out of the box ideas which you can put into practice via the work you submit. Doing these things is certainly not tough. You must try and make things interesting for yourself. Once you are able to beat boredom feeling which you are experiencing then you will automatically be much more pro active and the quality of work which you submit to your seniors will be of a very good quality. Finally if you realize that no matter what project you are working on, you are perennially tired and bored at work, then maybe you should consider a career change. Find a job that interests you and which makes you feel alive! Next articleHow to Write an Apology Letter to your Boss?